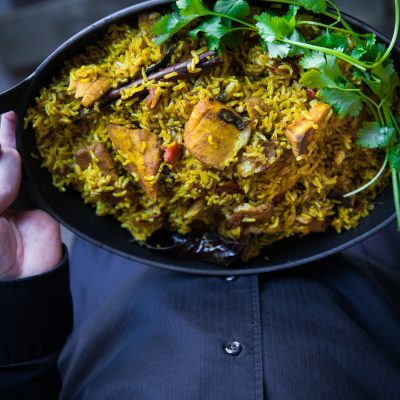 Super aromatic and delicious fish biryani made with brown basmati rice and pressure cooked to perfection with Instant Pot. Perfect one-pot recipe. Stove-top recipe is included too. Rinse the rice to get rid of any impurities. Make sure to drain off all water. There is no need to soak the rice with pressure cooker. Marinade the fish with the marinade ingredients and let stand for 20 minutes. Cover the lid. Turn the steam release valve to seal. Turn on pressure cook, high pressure and set the timer to 20 minutes. It will take about 5 minutes or so to pressurize. Once the 20 minutes is up, wait for 10 minutes and then turn the steam release valve to venting and let the pressure release and the pressure valve to collapse. Open the lid (and be amazed by the incredible aroma) and gently fluff the rice. Place the cooked fish pieces back into the pot. Decorate with additional fresh cilantro leaves. Serve warm.